Starting in 2010, unit trains of ethanol began traversing the Green Mountain Gateway route – a cooperation between three railroads, the Vermont Rail System, New England Central Railroad and the Providence & Worcester Railroad. The trains were delivered by Canadian Pacific to VTR in Whiethall, New York and made their way over the three roads, eventually ending up at Motiva Enterprises in Providence, Rhode Island. Somewhat recently that traffic had died down, and was being handled by CSX and PanAm Railways. Well, as of the end of October 2016, that had changed, and the moonshine has returned to the GMG Route. 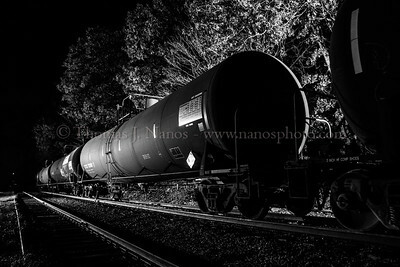 October 23, 2016 saw the return of the unit ethanol trains, and the timing worked out for an overnight trip through Connecticut on the NECR and P&W (click here to see all the posts tagged with ‘ethanol’). 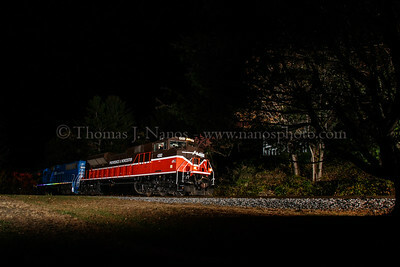 With the length of the train, I was able to set up and break down my flashes and move to a number of spots between Stafford Springs and Baltic, Connecticut, covering both the NECR and P&W portions of the trip. Nothing special with the lighting here – pretty flat, but I was simply documenting the move. And as a bonus, one of the P&W’s newest former FEC EMD SD70M-2 locomotives was on the point. 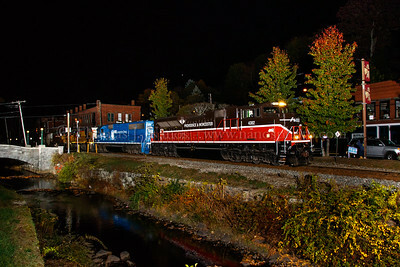 A joint Vermont Rail System/New England Central Railroad/Providence & Worcester Railroad ehtanol extra heads south on the NECR through Stafford Springs, Connecticut. A joint Vermont Rail System/New England Central Railroad/Providence & Worcester Railroad ehtanol extra heads south on the NECR through Willington, Connecticut. 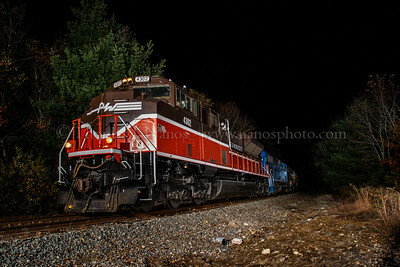 A joint Vermont Rail System/New England Central Railroad/Providence & Worcester Railroad ehtanol extra heads south on the NECR through Eagleville, Connecticut. 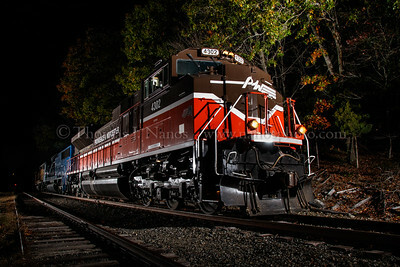 A joint Vermont Rail System/New England Central Railroad/Providence & Worcester Railroad ehtanol extra heads east on the P&W through Baltic, Connecticut.